Nothing is ever as it seems Quentin Coldwater is king of the bizarre and wonderful land of Fillory, but the days and nights of royal luxury are losing their appeal and Quentin is getting restless. Even in heaven a man needs a little adventure. So when a steward is murdered on a morning's hunt that is exactly what Quentin gets. But this quest is like no other. What starts as a flight of fancy, a glorified cruise to faraway lands, soon becomes the stuff of nightmares when Quentin is unceremoniously dumped at his parent's house in a decidedly un-magical suburb in Massachusetts. Back in this grey reality, Quentin has never wanted his magical kingdom more. Fortunately he is accompanied by his old friend Julia, who learned her own brand of black and twisted magic outside Brakebills College at an illegal, underground school in the real world. As they struggle through the paranormal alleyways, past Venetian dragons and fairytale houses, it becomes clear that only Julia's black arts can save them. But there is a greater power at work, one that is threatening to destroy Fillory forever, and to defeat it they must unravel the secrets of Julia's tragic past, and the terrible pact she made to gain her power. 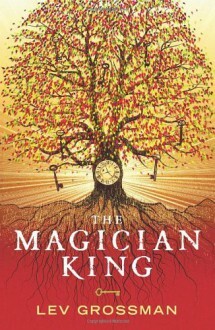 "The Magician King" is a grand voyage into the dark, glittering heart of magic, an extraordinary journey that allows the imagination to run riot and proves Grossman is the modern heir to C.S. Lewis. Series: The Magicians #2 What can I say? This is basically Julia's backstory coupled with Quentin being really stupid about looking for quests.